There are two sides to every story . . . Flip the book to read each side of the story in this enchanting tale of a whale and an octopus on their search for love, ending with a huge pop-up surprise. Big Blue Whale is feeling small. 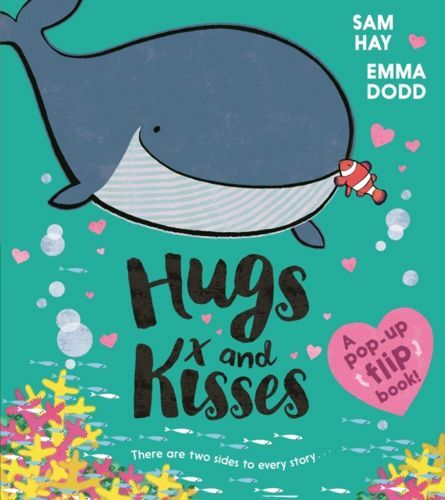 Everyone has someone to hug except from him!On his journey to find the perfect hug he meets lots of sea creatures who want to hug him including a kind clown fish and a sea horse with a very swirly, whirly tail. But he's just too big for them to hug!On the other side of the ocean, Octopus is playing bubble ball with her friends. But when she bangs her head (ouch!) she really needs a kiss better. She meets lots of friendly creatures who offer to give her a kiss, but her tentacles are just too tangly and she begins to think she will never get a kiss better . . . Join the two creatures as they journey across the ocean to find their perfect match. Finding Nemo meets Guess How Much I Love You in this under the sea story of love, determination and friendship. Perfect for Valentine's Day, Mother's Day, Father's Day or any other occasion, this is a wonderful gift for sharing with those you love. 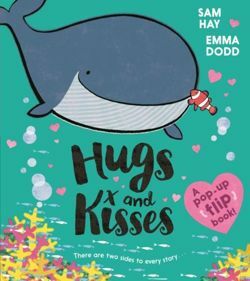 The huge pop up in the middle of the story, paired with Sam Hay's gentle, funny story and Emma Dodd's adorable illustrations is ideal for children aged 3 years and up and perfect for sharing together. Sam Hay grew up in Scotland in a family of bookworms. She always wanted to be a writer. She trained as a journalist in Edinburgh and worked in newspapers and for BBC Television, before moving to Wales where she wrote her first children's book. Since then she's had more than 30 children's books published, including Do Not Wash this Bear and Star in the Jar. Her new picture book version of Wizard of Oz publishes with Egmont in September 2018, along with a new chapter book series - Spy Penguins for Macmillan (US). Emma Dodd is a bestselling author-illustrator who was brought up in a family of artists in Surrey. She studied Graphic Design and Illustration at Central Saint Martin's School of Art and has worked in advertising, editorial and illustration. She has worked with several publishers including Orchard, Templar, Penguin, Macmillan (US), S&S, Harpercollins (US) and Nosy Crow. Her illustrated picture book, I Love My Mummy, written by Giles Andrea, won the Booktrust Best Book For Babies award in 2010 and was nominated for the Kate Greenaway Award. Among Emma's favourite things in life are surfing with her kids, punctuality and Scrabble.